Stations of the Cross are held every Friday in Lent and every First Friday, after the 12:00 P.M. (noon) Mass. 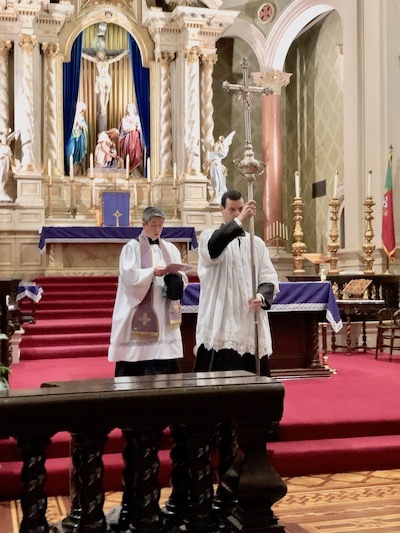 See this San José Apostolate News Story "Stations of the Cross April 5, 2019 at Immaculate Heart of Mary Oratory." This map is color coded to help you find the locations for the oratory's monthly get togethers, which take place after the 12:30 Sung High Sunday Mass in different locations around the church. Watch the bulletin for dates and times and occasional cancellations. All are invited to attend. These socials are a great opportunity to get to know other members of the oratory. We hope to see you there. Optional: Bring a dish or a drink to share. First Sundays, Finger Foods Potluck before Vespers at 3:00 p.m. 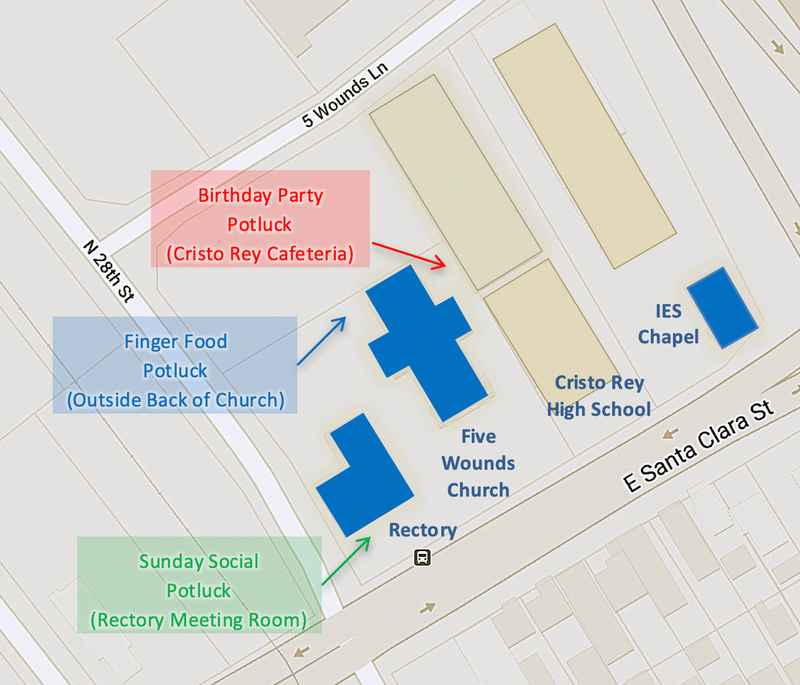 Between the 12:30 Sung Mass and Vespers, all are invited to a finger foods potluck behind the church. See the BLUE arrow. Finger foods are foods that can be easily eaten without heating or refrigeration or utensils. Everyone whose birthday is in that month gets a blessing, a song, and a sweet treat. There will be cake! The entrance to the Cristo Rey cafeteria is on the right when you are facing the church towards the rear. You can access it through a gate in the fence that separates the church property from the school. See the RED arrow. Once a month, Coffee Hour with coffee, tea, and snacks in the Rectory Meeting Room. The Five Wounds Rectory is to the left when you are facing the church. The meeting room is on the left side off the veranda in front. See the GREEN arrow. Infant Baptism: Parents requesting Baptism for a child must be registered members of the Oratory. First Holy Communion and Confirmation: Children must attend the sacrament-preparation catechism classes at the Oratory. Holy Matrimony: Couples planning to marry at the Oratory must contact a priest of the Institute of Christ the King for the proper instructions. Anointing of the Sick: Members facing surgery, serious illness or death may obtain the sacrament. Never wait, never hesitate ... remember: physical healing can also be an effect of the sacrament. Don’t deprive yourself or a loved one of God’s help. View our Mass intentions calendar here. Masses on First Fridays are reserved for the intentions of the men’s and women’s groups of the Oratory. The suggested donation for a Mass intention is $10 in the diocese of San José. Three Mass Intentions are allowed per month per family. If you submit a request for a date that is already assigned, you will be assigned another date. You can get envelopes for Mass requests and Mass cards from ushers at the front entrance to the church, and you can put the Mass requests in the collection basket with your donation. Input to the online Mass intentions calendar is usually made on Thursdays, so it is a good idea to check after Thursday to see if your desired date is available before submitting a new request. After the Mass intentions calendar for the calendar year gets full, we stop accepting Mass intentions until close to the start of the next year. Watch the bulletin for announcements. To find details about parish groups, click the Groups tab. 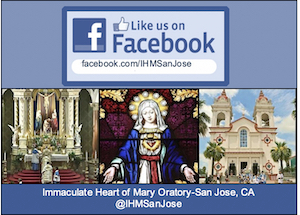 View our video: The Latin Mass: Immaculate Heart of Mary Oratory - San Jose, CA. To follow us on Facebook. 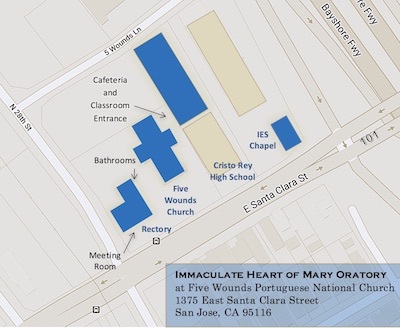 click the link Immaculate Heart of Mary Oratory-San Jose, CA or the image below. See galleries of photos of events at Immaculate Heart Oratory Galleries at Smugmug. Click the above image for a printable PDF of this map. Sunday Low Mass I.E.S. 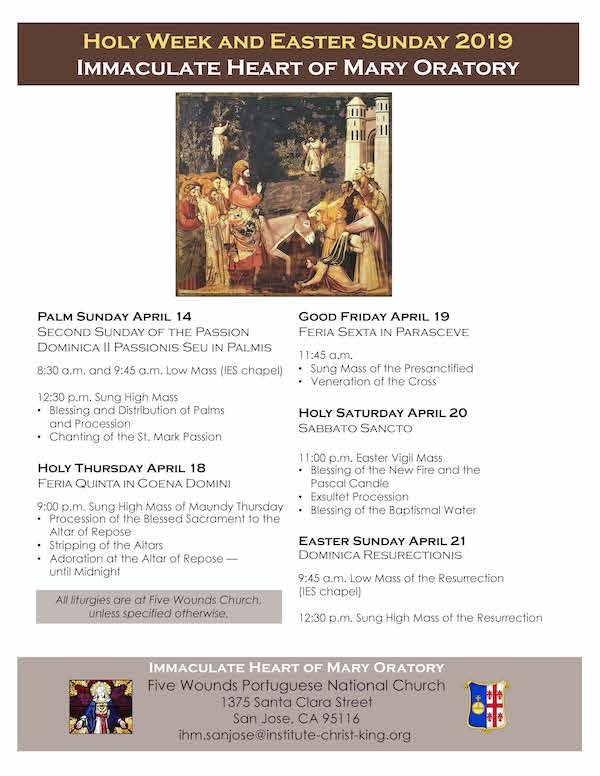 Chapel 8:30 a.m.
Sunday High Mass Five Wounds Church 12:30 p.m. 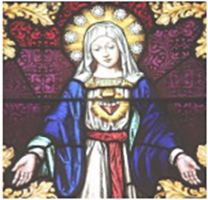 Weekday Mass Five Wounds Church 12:00 p.m.
First Saturday Mass IES Chapel 10:00 a.m.
Other Saturdays Mass Five Wounds Church 7:30 a.m.
Thursdays: Adoration until 2:00 p.m.
O Most Blessed Mother, heart of love, heart of mercy, ever listening, caring, consoling, hear our prayer. As your children, we implore your intercession with Jesus your Son. Receive with understanding and compassion the petitions we place before you today, especially ... (special intention). We are comforted in knowing your heart is ever open to those who ask for your prayer. We entrust to your gentle care and intercession those whom we love and who are sick or lonely or hurting. Help all of us, Holy Mother, to bear our burdens in this life until we may share eternal life and peace with God forever. Amen.